AlfaLogic is a global consulting and selective outsourcing IT solutions provider that combines an impressive command of industry expertise and leading technology capabilities with fully integrated on-site, off-site, offshore and blended delivery methodologies. Ability to work as a key team player through collaboration, training and mentoring. Ability to work with business stakeholders to identify needs and apply appropriate technical solutions. Certifications in Ax programming additional certifications are a plus. Excellent business communication and leadership; able to manage multiple projects concurrently. Proven capability to collaborate with non-professional as well as professional stakeholders at all levels. Ability to work in a team environment and add to his teams" knowledge base and AX experience. If your are looking for a change and available to join immediately do reply back your confirmation with the following details to info.india@alfalogics.com without which we shall not be able to process your CV. 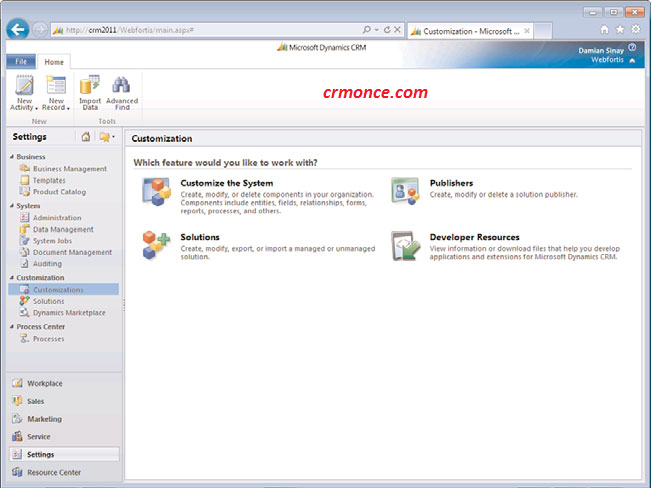 One of the most powerful features of Microsoft Dynamics CRM is that you can customize (or configure) all entities, such as Accounts, Contacts, and Opportunities.Navigate to the main entities customization screen by going to Settings and Customizations, and you will see that you can customize entities in several ways (see Figure 23.1). You can customize existing entities or create new entities. 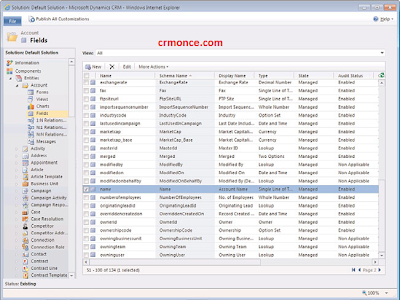 This version of CRM 2011 adds new ways to customize an entity without having to go this Setting area but going to any entity and either opening a Form of an entity and clicking on the customization tab on the ribbon will be enough to start making changes. The most basic principle is that Microsoft CRM is built in an n-tier model with the user interface layers (web client and Outlook client) on the top, the application layer in the middle, and the database layer represented by the SQL Server on the bottom. so always make the customizations following the principles. If you are an expert SQL database administrator or developer, you might be tempted to create database triggers or stored procedures, or change the database schema.However, we strongly recommend that you not touch the database directly in any situation. Doing so is considered an unsupported customization and might cause the application to break or fail. Two kinds of customization characteristics exist when working with Microsoft Dynamics CRM: supported and unsupported. Service packs might fail, break, or not install. Upgrades to the product might cause unexpected results or fail entirely. The application or database might become unstable and fail to work. We are looking for a MS Dynamics CRM consultant for Meridiansoft Infosystems,Hyd. Kindly check with the JD as in the below and reply back if available and interested. The candidate should have overall 5+ years of experience in Dot net and over 2-3 years of experience in MS Dynamics CRM. Have an understanding of basic development best practices. Responsibilities will include the design, development, and implementation. MeridianSoft Info Systems Pvt. Ltd.
Kaar Technologies (www.kaartech.com) is a company of professionals focused on providing SAP and SAP NetWeaver related services. Headquartered in Chennai, India, with offices in Netherlands, Saudi Arabia US, Singapore and Canada. We are a joint venture company with a certified SAP services provider in Netherlands..